Happy Birthday to me!! One thing you may not know about me based on my blog history is that I am a sucker for ice cream. It's one dessert that is really hard for me to turn down. Especially good quality ice cream, or even more so homemade ice cream! Homemade ice cream really might be one of the best things in the world. At least my world! Recently I had a strong desire to make some ice cream. I asked Rob what kind he wanted and he asked for Snickers. Well, I wanted something I haven't made before, but I didn't want to disappoint him, so while at the grocery store picking up some cream I stood in the candy aisle for a solid 5 minutes debating what to get. I knew I wanted a combination of candy bars, and I'm pretty certain I discovered the best candy ice cream combination. Ever! Snickers. Butterfinger. Twix. Boom. That. Just. Happened. The ice cream uses a simple, though always delicious, vanilla base, and it's as easy as adding in chopped candy bars. The combination of chocolate, caramel, cookie and peanut butter is just perfect. The only thing we might do next time we make this (which will be soon I can assure you), is chop up some chocolate covered pretzels to sprinkle on top. Then it'll be like a Take 5 ice cream! Combine the milk, sugar, 1 cup of the cream, and the salt in a medium saucepan. Scrape the seeds from the vanilla bean into the pan and drop in the vanilla pod. Heat over medium-high, stirring occasionally, until the mixture is warmed through. Remove the pan from the heat, cover, and let the mixture steep for 30 minutes. Pour the remaining cup of cream into a bowl and set a fine mesh strainer over the top. In a separate medium bowl, whisk the egg yolks until smooth. Slowly pour the warm milk mixture into the bowl with the egg yolks, whisking constantly. Return the entire mixture to the saucepan and place over medium heat. Cook, stirring constantly and scraping the bottom of the pan, until the mixture thickens slightly and coats the back of a spoon. Pour the custard through the mesh strainer into the bowl with the cream. Stir in the vanilla. Let cool slightly, then cover and refrigerate until completely chilled. Remove the vanilla bean before churning. Freeze in an ice cream maker according to the manufacturer's instructions. 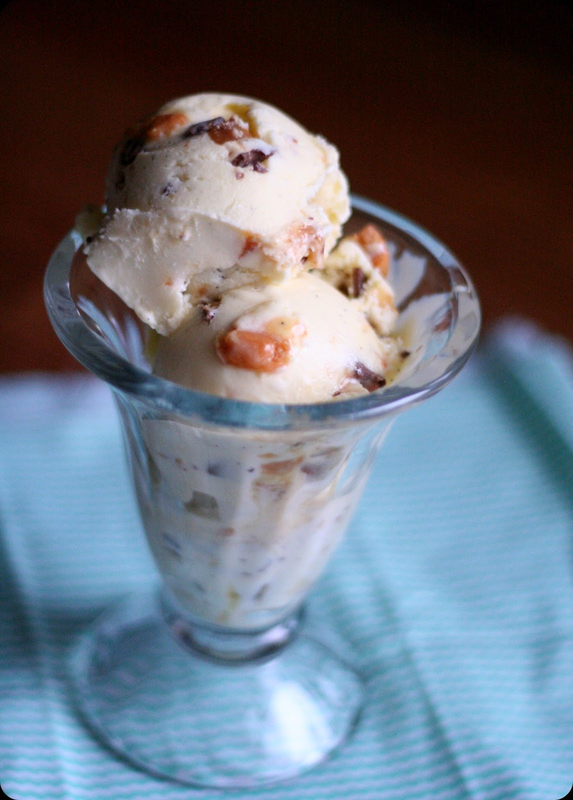 Mix crushed candy bars in churned ice cream. Transfer to a freezer-safe container and store in freezer until ready to eat. Ice cream will be more like soft serve immediately after churning and will take a few hours to harden in the freezer. Happy Birthday to you and what a perfect way to celebrate!!!!! Looks absolutely sinful! Happy Birthday!! This ice-cream looks so amazing and right up my alley. It looks like a great way to treat yourself!